In this first NFL preview, we cover the players, specifically, the quarterbacks. Why the emphasis on quarterbacks? They are the centerpiece of offense in football. Quarterbacks are not just leaders in terms of directing the team, but are all the other things we expect and rarely get-- attributes like motivation, character, and charisma. These are the guys that everybody follows, not because they have to, but because they want to. Their role by de jure and de facto brings excitement. I'm just bringing you the basics. If you’ve managed to pull yourself away from Season 1 marathons of Jersey Shore, you’ve noticed a recent uptick in football on TV. There is a good reason and that’s because the National Football League’s (NFL) preseason has begun. Most people don’t watch entire preseason games unless they are die-hard fans, but they do follow the drama leading up to the season. In this first preview (yes, first implies there will be more) I’ll give you storylines on three players that will be in the news this season. McNabb is a 33 year-old quarterback for the Washington Redskins. It’s his first year with this new team, spending all of his time thus far with the Philadelphia Eagles. Now, admittedly, some of my bias is creeping into me talking about McNabb. My wife’s entire family are Eagles fans and I live outside of DC, so this drama is front and center. Donovan was what you’d call the centerpiece of the Philadelphia Eagles for ten years. Drafted as the second overall pick in the draft, he has been one of the better quarterbacks in the NFL over that time. Eagles fans actually booed him when he was picked instead of a running back most considered the better option; they’ve come to love him over time (sort of). He’s taken his team to the play-offs nearly every year, but he’s only been to one Super Bowl and he lost that one. He leads the Eagles all time in career wins, passing yards, and passing touchdowns. In the off-season, McNabb was traded to the Washington Redskins. This was a surprising move, given that McNabb was playing well with the Eagles and the Redskins play in the same division (meaning he’d face the Eagles twice during the regular season.) Obviously, you don’t want to give your rival a good player, especially if he’s the one that turns the tide during the season. McNabb is starting to enter the twilight of his career and after 10 years he hasn’t taken the Eagles to a Super Bowl win. 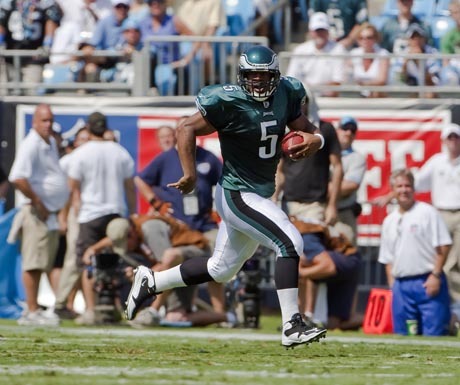 The quarterbacks that Philadelphia has behind McNabb are mediocre at best, so the team could take a step back. On the other hand, the Redskins have been abysmal over the past few seasons. They’ve played musical coaches with little success. Their quarterback (Jason Campbell) was a college standout, but is a spaz in the NFL. This season, the Redskins made a lot of big moves-- hiring a new coach (Mike Shanahan), getting rid of Campbell and hiring McNabb. They’re installing a new offense and trying to get back to winning. The McNabb move will be interesting to watch throughout the season. If the Eagles choke and their quarterback (Kevin Kolb) can’t get it done, while on the other hand the Redskins start to win ballgames, everybody will question this move. My father-in-law is a classic McNabb hater. I’ll be glad to let loose the “I told you so’s” when an Eagles team without McNabb takes a nose-dive. One Liner: “Nothing like giving your best weapon to your enemy. Real slick.” – Referring to trading Donovan McNabb to the Redskins after 10 years of successful play with the Philadelphia Eagles. The controversy around Brett is that he’s retired twice, and both times decided to come back. It happened again this year when he injured his ankle in a bid to make the Super Bowl with the Vikings. Controversy has swirled all year as to whether he’ll come back or not. ESPN reported that he was sending text messages to teammates saying it was over. Within hours, Favre clarified saying he would play, but only if his ankle were healed enough to play. The Vikings have already started training camp, but Favre has the experience to make that a non-factor. Some view his actions as selfish because he owes it to the team to either plan on having him or to move on. Others understand the difficulty he has ending his career, a game he loves and the only way of life he knows. Either way, this decision will have a huge bearing on the future of the Minnesota Vikings. With Brett Favre, Minnesota can make it to the Super Bowl. Without him, they’ll be lucky to make the play-offs. One Liner: “I’d un-retire 30 times if they keep throwing 16 mil at me.” -- Referring to the purported amount the Vikings offered Brett Favre to return for another season. Ben Roethlisberger, or “Big Ben” is a quarterback for Pittsburgh Steelers. He was named the Rookie of the Year in 2004, his first year playing professional football. In his second year with Pittsburgh, he led his team to win the Super Bowl, becoming the youngest quarterback to win the NFL’s championship game. Ben is one of the most efficient passers in NFL history, and has the 5th highest winning percentage as a quarterback. He’s known for his back yard football style (often improvising on the fly) and his atypical build. He’s 6’5” and 241 lbs, as big as some defensive linemen (typically big dudes). The real straw came in March of this year when Ben was at a nightclub near Georgia College and State University where he got together with a 20 year-old student. While the details are sketchy, Ben admitted to having contact with the woman, but not “consummating.” Whatever that means. The girl, evidentially shook up, went to a hospital because she believed she was assaulted. There were cuts that indicated assault, but the district attorney never prosecuted because of lack of evidence. The victim didn’t file a lawsuit because she didn’t want the drama brought on her and her family. Regardless, the commissioner of the NFL, Roger Goodell suspended Roethlisberger for the first six games of the season. He said that Ben violated the NFL’s personal conduct policy. Goodell has broad powers in setting suspensions and has taken a hard line recently player misconduct. As with Favre, Roethlisberger makes a huge difference for this team and will probably make or break them this year by his absence. One Liner: “Maybe putting Ben in time out will give him time to think twice about chasing 20 year-old sorority chicks.” – Referring to the 6 game suspension given to Roethlisberger for alleged sexual assault against a college coed from Georgia College and State University.